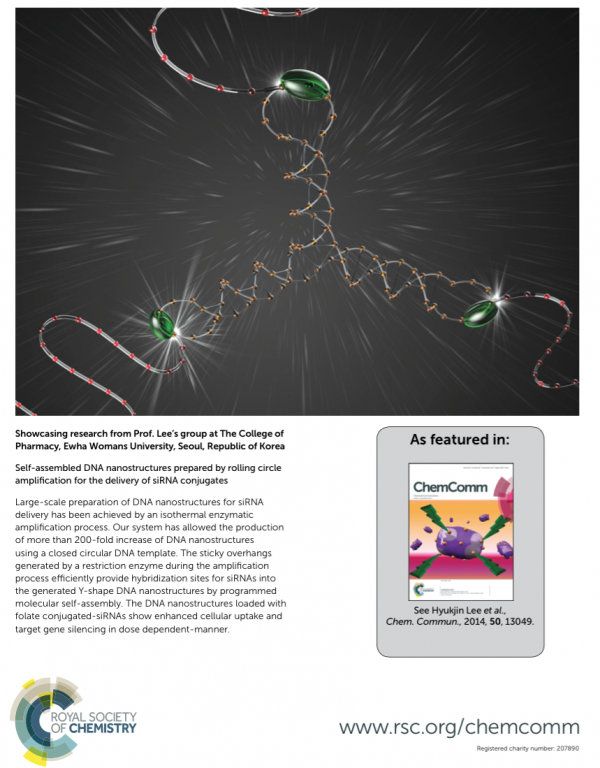 Using a technique known as “Rolling Circle Amplification (RCA),” Prof. Lee’s group has developed a large-scale synthesis method for preparing tiny particles made out of DNA and RNA that can deliver snippets of RNA directly to tumors, turning off genes expressed in cancer cells. To achieve this type of gene silencing, known as RNA interference, many researchers have tried — with some success — to deliver RNA with particles made from polymers or lipids. However, those materials can pose safety risks and are difficult to target, says Hyukjin Lee, an assistant professor of College of Pharmacy at Ewha Womans University. ​The new particles developed by researchers at Ewha appear to overcome those challenges as well as facilitate the commercialization of RNAi drugs by reducing the production cost. Because the particles are made of DNA and RNA, they are biodegradable and pose no threat to the body. They can also be tagged with molecules of folate (vitamin B9) to target the abundance of folate receptors found on some tumors, including those associated with ovarian cancer — one of the deadliest, hardest-to-treat cancers. Lee is senior author of a paper on the particles appearing in the June 17 issue of Chemical Communications. Lead author of the paper is former Ewha postdoc Cheol Am Hong, now a postdoctoral associate at the University of Irvine, California, USA. Second author is Bora Jang, a pharmacy undergraduate student who is joining to the Prof. Lee’s group this spring as a graduate student. 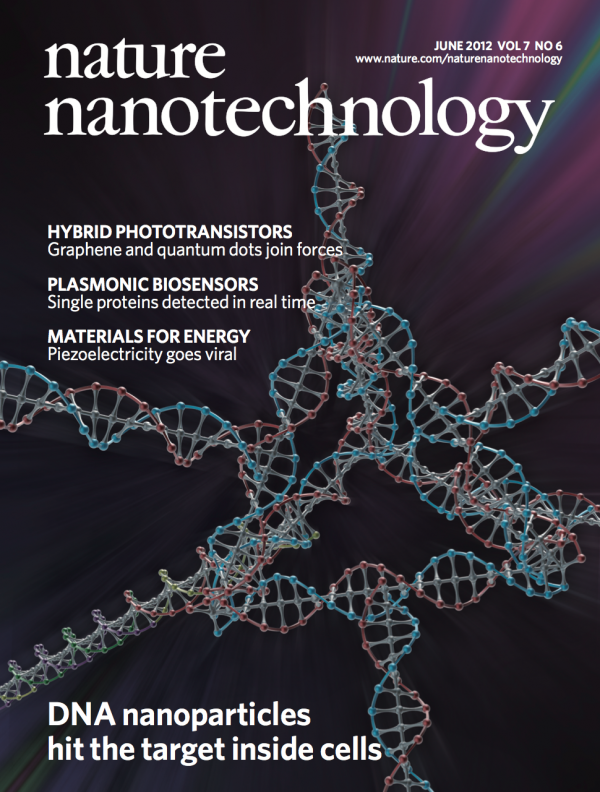 siRNA-delivering nanoparticles made of DNA, which Prof. Lee’s lab and Alnylam already developed in 2012 (Nature Nanotechnology 2012, 7, 389), have shown some success in turning off cancer genes in animal studies, and preclinical trials are now underway — but it has been difficult to prepare the DNA nanoparticles in large scale to utilized these carriers for large animal studies. Major obstacle to fulfilling the promise of RNAi has been finding ways to prepare the mass-production of delivery carriers and short RNA strands. To avoid conventional synthetic DNA/RNA preparation, which costs a lot of money, Lee and his colleagues decided to try utilizing isothermal enzymatic reaction to prepare DNA and RNA strands in a simple nanostructured particle. Using rolling circle amplification (RCA) — which allows researchers to generate a very long single stranded DNA or RNA — these long single stranded DNAs can self-assembled to form a four-armed Holiday junction. A single RNA strand was then affixed to each end of the junction. “What’s particularly exciting about preparing self-assembled nucleic acid nanoparticle by RCA is the fact that you can make molecularly identical particles in large-scale and define the location of every single atom,” Lee says. To target the particles to tumor cells and facilitate the entry of these particles inside of cells, the researchers attached three folate molecules to each Holiday junction. Using nucleic acid nanoparticles, the researchers have much more control over the composition of the particles, making it easier to create identical particles that all seek the right target. The team is now designing a large animal study to evaluate the efficacy of DNA nanoparticles to target genes that promote tumor growth, and is also working on shutting off genes involved in other genetic diseases. This research was supported by grants from the Bio & Medical Technology Development Program of the National Research Foundation (2012M3A9C6049834) and by the Global Initiative Research Center (GiRC) Project funded by the Ministry of Science, ICT & Future Planning (2012K1A1A2A01056092). Self-assembled DNA nanostructures prepared by rolling circle amplification for the delivery of siRNA conjugates.